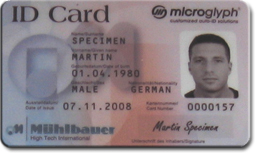 Microglyph codes can be marked on smart cards, such as Identity Cards, GSM, Phone- or Creditcards. The unobtrusive codes are invisibly embedded in the graphic design. Quick laser pulses on “Multilayer-Cards” cause a color change below the surface of the material, without changing the clear top layer. Another method is “tactile marking”, where a recast of the top layer is produced by laser engraving and carbonizing.